In an open letter to Star Wars Galaxies Account Holders, Sony Online Entertainment revealed they will be shutting down 12 servers. They "blame it" on the "overwhelming success of the recent Free Character Transfer Service". Character creation will also be disabled on the affected servers beginning September 15, 2009 at 4:00 AM PDT. 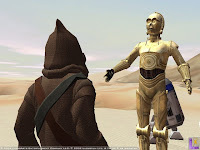 Star Wars Galaxies still has 13 active servers, and has some important introductions: the Chronicle Master System, Death Troopers, and the upcoming Galactic Civil War enhancements.